Tuna may be known these days as a popular canned food, but it does begin its life as a fish, a saltwater fish to be precise. 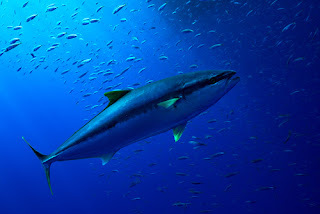 Along with the mackerel, tuna are the only fish species that have the ability to maintain a body temperature higher than the current temperature of the water. Generally spotted swimming in warm water, the tuna maintains a high demand when it comes to commercial fishing and it is also a popular game fish. More than seven species of tuna dwell in the oceans of the world, and they all lead lives as nomads, living up to thirty years in a few cases. Measuring over six feet and weighing over 500 pounds, the tuna is no easy feat to catch. If those numbers come across as large, consider that the largest tuna ever caught was more than twenty feet long and weighed a humongous 1,600 pounds! Tuna are nimble predators, and their colors are perfectly suited for camouflage. Despite their massive size, they can cruise through the ocean waters at over sixty miles per hour. Along with the speed, the fish is capable of adjusting the position of its pectoral and dorsal fin to boost acceleration and keep drag to a minimum, which helps tremendously in catching prey. Herring, mackerel, squid and crustaceans are a few examples of a tuna’s preferred prey.